Paraffin Bath - Arm/Hand/Foot Model PB-105,4 standard and 4 oversize steam packs are included with the heating unit. 4 standard and 4 oversize steam packs are included with the heating unit. Paraffin Bath - Arm/Hand/Foot Model PB-105 Temperature control that provides maximum variation of plus or minus 1°F. Timed melting or sterilizating Hi-Heat temperature circuits. Heated drain. The Monel tank will not corrode after extensive contact with paraffin and body perspiration. Integrated heating elements provide an even heat flow with no dangerous hot spots. Light mahogany moulding provides a comfortable cool rest for the patient's arm or leg and protects against the heat of the tank and paraffin splashes. 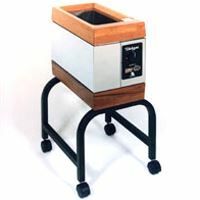 All Dickson institutional bath models are shipped complete with pure paraffin, white oil, plexiglass bottom slats, cover and test thermometer. The arm, hand and foot bath has a 25 x 11.5 x 10” deep tank. Approximate 50 lb paraffin capacity.